FEATURES OF CNC CONTROL SYSTEM The CNC control system consists of a SIEMENS S7 series PLC configured for closed loop position control via AC servo motors for the material feed and forming operations. The control system is very flexible in programming to form many variations of round and non-round parts. The operator interface is a Touch Screen HMI. The touch screen is capable of storing over 100 part programs of up to 50 forming steps per programs. 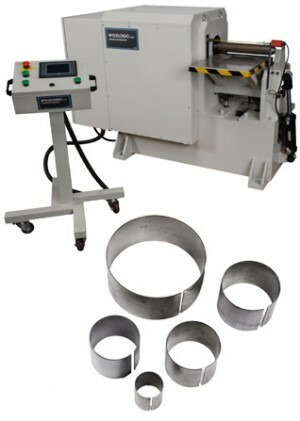 OUTSTANDING FEATURES FOR 3 ROLL HYDRAULIC INITIAL PINCH PLATE BENDING ROLL MAIN DRIVE: This function is accomplished by the use of highly efficient AC Servo motors. ROLLS AND BEARINGS: Rolls are machined from 1040/1045 steel. All rolls are crowned for the capacity of the machine. Crowning compensates for the deflection of the rolls under load. All four rolls ride in roller/ball bearings requiring very low maintenance.